...and his execution of said scenes just blew me away. Better than I ever imagined. He got some of the "money shots" of the series (a full pager that involved Illyria in issue 14 comes to mind) but at the same time, his quiet moments were just as great. He drew a handful of scenes with Gunn that were emotional to look at, before dialog was added. ...well, starting next issue, daddy has come home. Franco Urru picks up right where we left off in issue 14. The last three issues of AFTER THE FALL will knock you down sideways (is that a saying? It should be a saying). 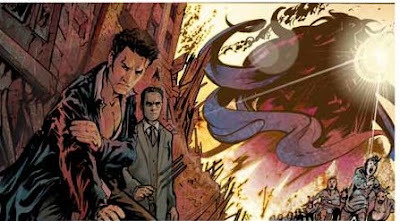 Here's a taste: the first panel of the first page of Franco's return. Unbelievable. It only gets more epic from there. Sorry to see Mooney go, happy to have Franco back. Good luck to you, Stephen, and I look forward to seeing more of your work in the future. Looks amazing! And I agree with Emmie, best of luck to Mr. Mooney! ...How do you follow a comment like that? I'll steer away from passionate tentacled goings-on and just state for the record that I'm possibly in man-love with Brian Lynch. In as much as a man CAN love another man. Working with him and Chris on Angel was a literal dream come true. SO grateful. And I feel like we put out some pretty decent books. But why only 17? I know "Aftermath" is coming soon and that is great and all but why only 17 issues when say Buffy season 8 is closer to 40? As you can tell, this fan is greedy and loves the entire series, it was very enjoyable, but again, why only 17, and isn't 17 an odd number, why not go for 22 like a regular season? I think I may buy 15,16 and 17 and then read them together, otherwise it will be shear torture waiting inbetween months. Ciao and happy holidays all!!! Got a case of the post vampire monkeys. We made Amazon's Top Ten List of the Year!